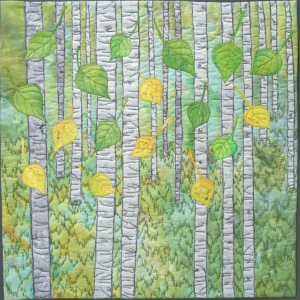 We are so excited to announce the winners of the 2017 Quilt Alliance quilt contest. The theme of the 2017 competition is “Voices”. 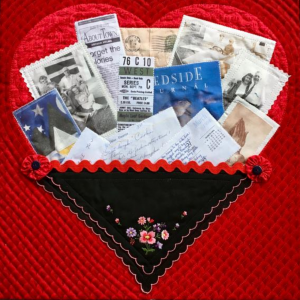 We invited members to share their opinions, memories, language and truths in the form of a 16″ X 16″ quilt. 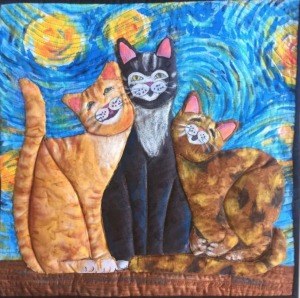 After judging, all of the beautiful contest entries were donated to the Quilt Alliance for our annual quilt auction fund-raising event. 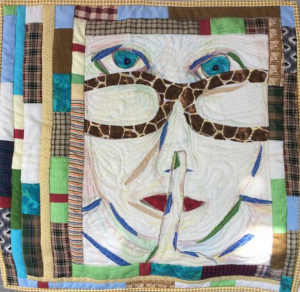 You can go to the Quilt Alliance auction site to view all of the quilts and can bid on the quilts starting Nov. 13, 2017. 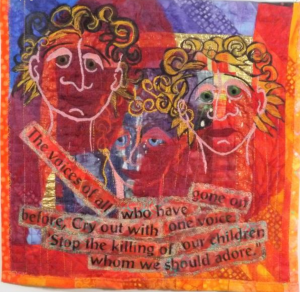 It’s a wonderful opportunity to own one or more of the special “Voices” quilts. 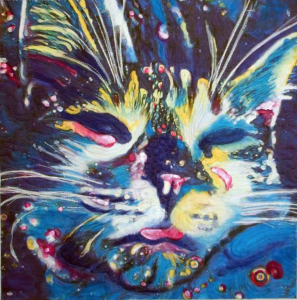 Carol Poole of Rockledge, Florida, is the winner of this year’s First Place Award selected by Quilt Alliance members. 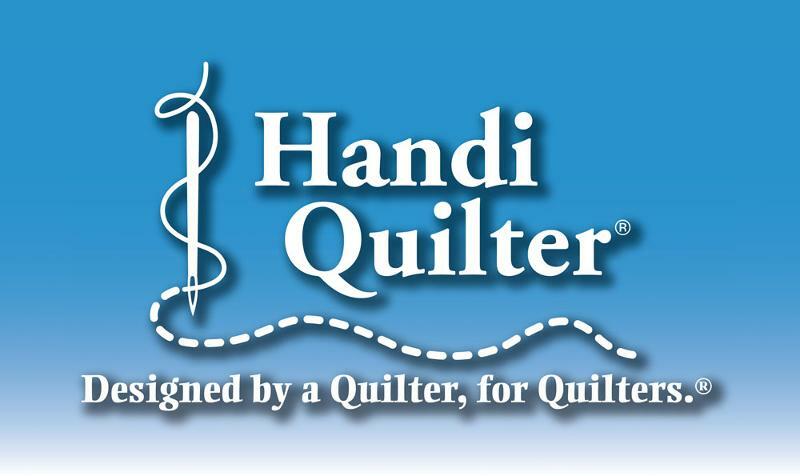 Carol’s prize is an HQ Stitch 710 sewing machine provided by Handi Quilter (retail value: $3,495.00). 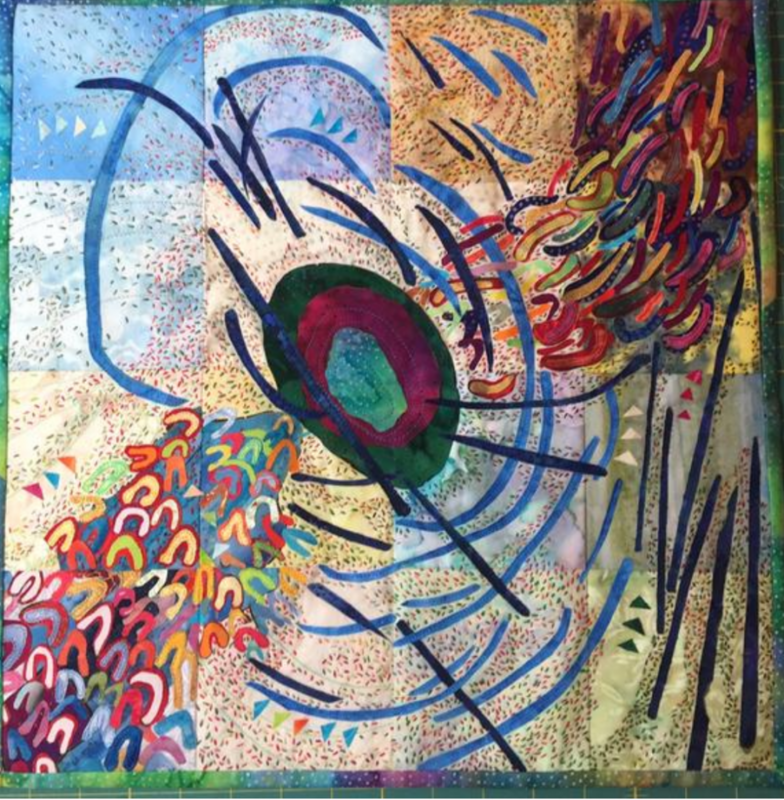 Her quilt “My Alzheimer’s Voice,” pictured below, was made with hand dyed batiks and silk batting, using burned fabric and raw edge applique techniques. 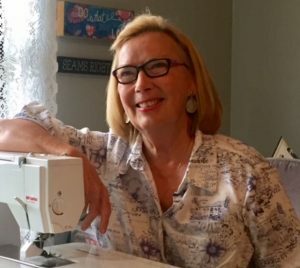 “I used my seam ripper for something besides unsewing,” says Poole. “I held the metal point over a candle until quite hot, then punched holes, to create the burned holes in my fabric, simulating the small burnt holes in my memories. 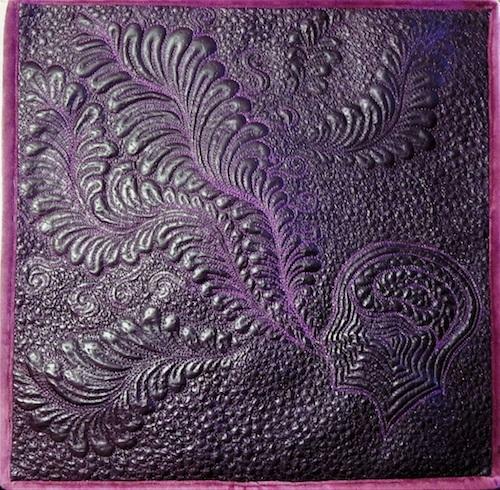 “My Alzheimer’s Voice” by Carol Poole. 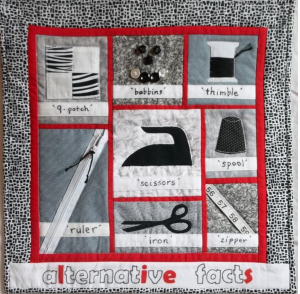 Quilt Alliance members chose Tim Latimer’s “Quilt Talk,” pictured below, to receive the Second Place Award, an HQ Stitch 510 machine, provided by Handi Quilter (retail value: $1,495.00). 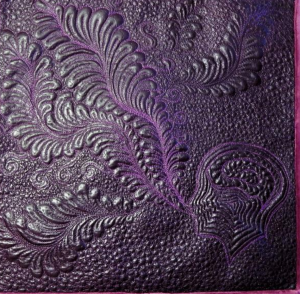 Latimer, from Lansing, Michigan, created his piece from quilted leather, using free motion quilting on an antique treadle sewing machine. 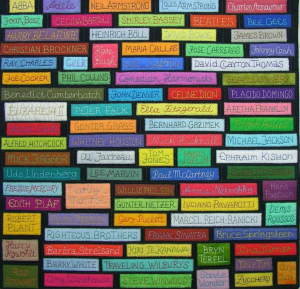 “Quilt Talk” by Tim Latimer. 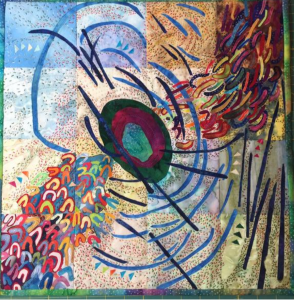 The Third Place Award, also selected by Quilt Alliance members, goes to Ramona Bates of Little Rock, Arkansas, for her quilt, “On (the Line),” pictured below. Bates wins an HQ Stitch 210 machine, provided by Handi Quilter (retail value: $595.00). 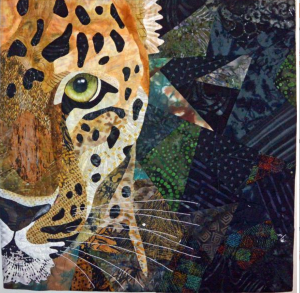 Judge’s Choice Awards were given to these six artists by quilt world professionals who were invited to participate in choosing their favorite quilts. Our thanks go to each and every one of them. 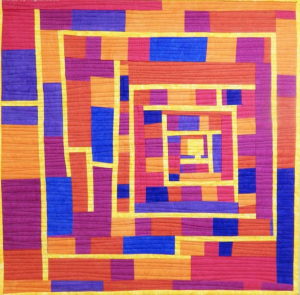 Honorable Mention and Judge’s Choice Award winners will receive Aurifil Thread Collections. 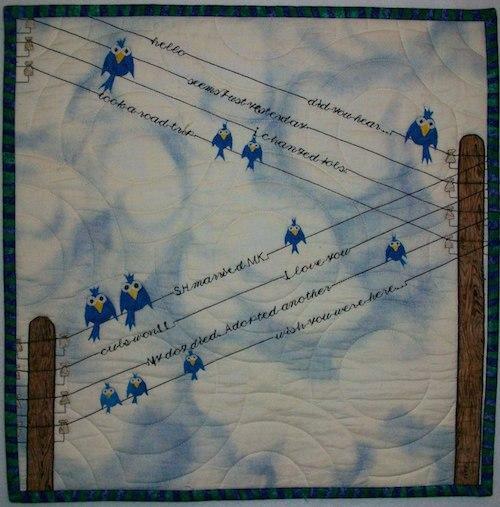 All winners will receive StoryPatches quilt labels. Online auction begins Nov. 13, 2017. 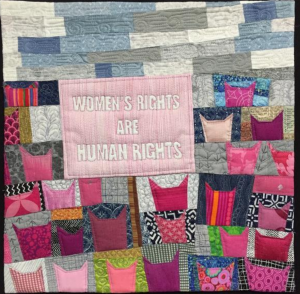 Quilts will be exhibited at Quilters Take Manhattan event on Sept. 16, 2017, and in the Quilt Alliance booth at the International Quilt Festival, Nov. 2-5, 2017.